Lyndon Leaders 4-H Club members were recognized at Achievement Night, from left, Josye Hutchcroft, Brynna Whitton, Reanna Marcotte, Breckyn Whitton, Ethan Kneisler, Garrett Shoup, Leanne Shoup, Allie Kneisler, Ryan Bones, Brayden Marcotte, Cade Shoup, Lara Shoup. The Lyndon Leaders 4-H Club had its monthly meeting on Nov. 4, 2017. The majority of the meeting consisted of the election of new officers for the upcoming 2017-2018 4-H year. The newly elected officers are: President Ethan Kneisler, Vice President Brayden Marcotte, Secretary Ryan Bones, Treasurer Allie Kneisler, Reporter Garrett Shoup, and 4-H Council representatives Ethan and Allie Kneisler. New business included voting to do a hog raffle at the Lyndon basketball games this winter, as well as doing a $5 gift exchange after the Winter Festival in December. For recreation, the club did a Christmas wrapping contest. The wrapped boxes will be used to decorate the float for the Winter Festival parade in December. 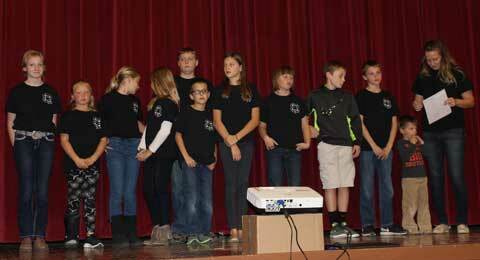 Following the meeting, club members attended Achievement Night in the Lyndon High School Auditorium at 7 p.m. The next meeting will be at 9:30 a.m. Dec. 2, 2017, prior to participating in the Winter Festival parade at 10 a.m. The Lyndon Leaders 4-H Club had its monthly meeting on Sept. 10, 2017. The meeting was centered around setting new goals for the upcoming year and planning an October meeting that would be geared toward new members. For roll call, members worked on their club mission statement by filling in the following sentence, “Lyndon Leaders is …” For the program, members took this a step further by breaking into groups and elaborating on their club mission, as well as brainstorming ways to make the October meeting more “new member” friendly. After discussion, each group presented their ideas in front of the club. Recreation was held by the Kilgore family, which was a great team building activity involving straws, blindfolds, and tape. The Lyndon Leaders 4-H Club had its monthly meeting on Oct. 8, 2017. The theme of the meeting was geared toward new members, giving them a preview on what 4-H is all about. Throughout the meeting, President Kaelin Bones stopped to explain what and why we do the things we do in the meeting, including parliamentary procedure. For the program, Ethan Kneisler shared an overview of what our club does throughout the year. Brayden Marcotte followed with a project talk on shooting sports, and Kaelin Bones with a demonstration on how to make slime. All current 4H members brought a variety of past projects to display for new members to preview. It was a “mini fair” and gave everyone a hands-on experience on what projects look like when they are finished and what it looks like to have projects displayed at the fair. The meeting ended with a fun game, involving pumpkins, hosted by the Marcotte family. Also in October, the Lyndon Leaders 4-H Club helped host the annual trunk or treat event held Oct 29, 2017, at Jones Park. The club had four vehicles they decorated: One with a camping theme; another with putt-putt golf in a pumpkin, a third with pumpkin bowling, and the fourth with decorated with a ghost theme using toilet paper. The club handed out candy in addition to glow sticks to promote Halloween safety. It was a fun event for all. 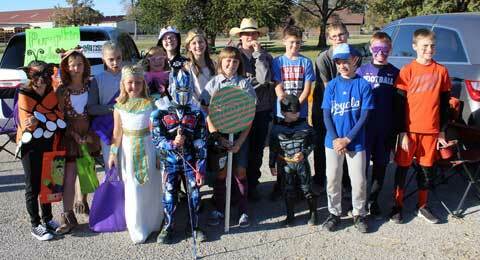 Lyndon Leaders 4-H Club at Lyndon’s trunk or treat event, front from left, Brynna Whitton, Garrett Shoup, Allie Kneisler, Cade Shoup, James Marcotte, back, Morgan Young, Breckyn Whitton, Reanna Marcotte, Kendall Young, Morgan Gross, Leanne Shoup, Ethan Kneisler, Dax Miller, Toby Miller, Ryan Bones, and Brayden Marcotte.